Cooking for two can be easy, economical, and fun. If you think great dinners for two always means cutting down a recipe or worrying about eating lots of leftovers, then you will love these healthy dinners for two that you can make fresh and require minimal ingredients. Here are 10 assorted chicken, seafood, and vegetarian options with easy-to-find ingredients, many that you might already have in your pantry. So go ahead and set the table, light the candles, and put on some great dinner music — with these meal ideas you’ll have dinner on the table in under 20 minutes! Cook the barley according to the package instructions and set aside. Heat a large skillet over medium heat. Add the olive oil, onion, mushrooms, salt, and black pepper. 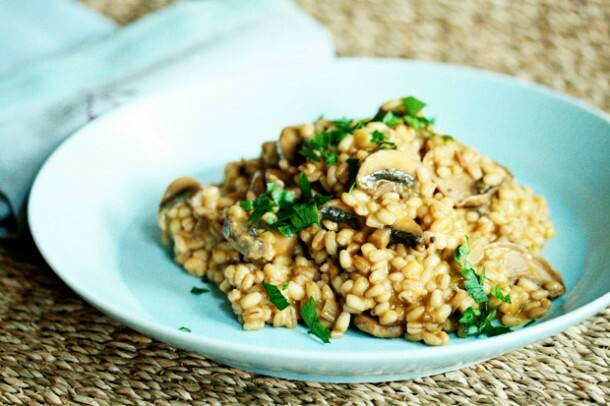 Cook 2 to 3 minutes, stirring often until the mushrooms soften. Reduce the heat to low and add the barley. Stir well and turn the heat to low. Stir in the cream cheese and sprinkle with parsley. Serve immediately. Season the chicken with salt and pepper. Dredge in flour. Heat the oil in a large skillet over medium high heat. Add the chicken and cook 2 minutes per side until brown. Transfer to a plate. Add the white wine and balsamic. Cook 1 to 2 minutes scrapping up any bits sticking inside the pan. Return the chicken to the pan, along with the cherry tomatoes and add the chicken stock. Cook 1 minute more, turning once until the chicken is cooked through. Sprinkle with basil and top with the mozzarella cubes or balls, serve immediately. Preheat the oven to 400°F. Cook the pasta according to the package instructions. 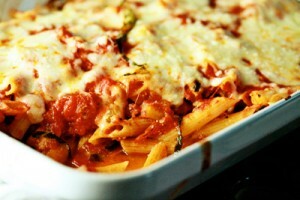 Toss with the marinara sauce and kale then transfer to a small 8×8 baking dish. Sprinkle with the mozzarella and transfer to the oven. Bake uncovered 15 to 20 minutes until the cheese is melted and bubbly. Serve immediately. Season fish with the pepper and dredge in flour. Heat the oil in a large skillet over medium high heat. Add the fish and cook 2 minutes per side until brown. Transfer to a plate. To the skillet, add the lemon juice, chicken stock, and capers and bring to a simmer, scrapping the browned bits from the bottom of the pan. Return the fish to the pan and cook 1 minute more, turning once until the fish is cooked through. Add the butter, and capers stir to combine. Sprinkle with parsley and serve immediately. Preheat oven to 400°F. 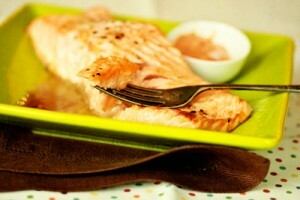 Place the salmon filets in an 8×8 baking dish. In a small bowl mix the mustard and the honey. Coat the tops of the filet with the honey mustard and sprinkle with the pepper. Bake 8 to 10 minutes until the salmon flakes with a fork. Serve immediately over the mixed salad greens. Season chicken with salt and pepper and dredge in flour.Heat the oil in a large skillet over medium high heat. Add the chicken and cook 2 minutes per side until brown. Transfer to a plate. Add the mushrooms and the butter. Cook 1 to 2 minutes until the mushrooms begin to soften. Add the Marsala and bring to a simmer, scrapping the browned bits from the bottom of the pan. Return the chicken to the pan and add the chicken stock. Cook 1 minute more, turning once until the chicken is cooked through. Sprinkle with parsley and serve immediately. Season fish with the salt, chili powder, cumin, and black pepper. Heat the oil in a large skillet over medium high heat. Add the fish and cook 2 to 3 minutes per side until brown and cooked through. Transfer to a plate and squeeze the lime wedges over the surface of the fish. 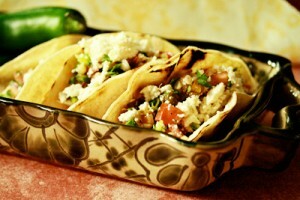 Divide the fish between the tortillas and top with the feta, salsa, and the cilantro. Serve immediately. Traditional “Quattro Stagione” pizzas have a prosciutto quadrant, but this vegetarian version swaps in more vegetables in its place. 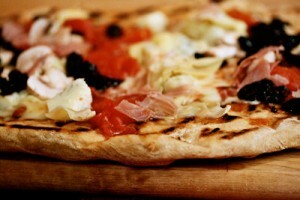 For meat lovers, go traditional by all means, and add two sliced of San Daniele or Prosciutto di Parma. Preheat oven to 400°F. Roll the pizza out to a 6-inch disk. Transfer to a baking sheet or pizza pan. Spread the marinara over the dough and sprinkle with the mozzarella. Sprinkle the artichokes over one quarter of the pizza, making a “quadrant” or “seasonal slice” with just artichokes. Do the same with the other toppings. Transfer to the oven and bake 10 to 15 minutes, until the dough has browned and the cheese is hot and bubbly. Cool 5 minutes before slicing, then serve. Thread the broccoli, zucchini, tomatoes, and mushrooms onto the skewers. Heat a large skillet or grill over high heat. Coat the skewers with the cooking spray. Cook the skewers 3 to 4 minutes, turning often until the vegetables soften. Transfer to a plate. 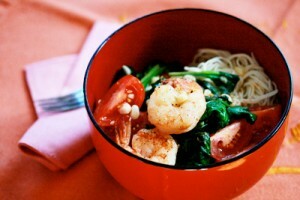 Place the peanut butter, soy sauce, garlic, and ginger in a small bowl. Add a few tablespoons of warm water and whisk well until a smooth creamy sauce forms. Serve immediately with the skewers. Sprinkle the shrimp with salt. Warm a large skillet over high heat. When the skillet is hot, add the oil. Carefully add the shrimp and corn to the pan. Cook for 3 to 4 minutes until the shrimp turns pink and is no longer translucent in the center and the corn is lightly browned. Place spinach on top and cover. Cook an additional 1 to 2 minutes until the spinach wilts. Toss with the tomatoes, lemon zest, juice, and mustard, cayenne or hot sauce. Sprinkle with herbs and serve immediately.